Tangata Whenua — People of the Land — is the name that Māori call themselves as indigenous New Zealanders, and likely signifies the deep roots they have to this green and blue place of jagged peaks and valleys. The land sustains us. It carries paths to the future as well as ties to the past: whatungarongaro te tangata, toitū te whenua – people disappear, but the land remains. But what shape will it be in when we’re gone? For Māori, the importance of kaitiakitanga (loosely translated as ‘guardianship’) is told to each new generation, to ensure that they too become kaitiaki. And after 800 years of kaitiakitanga, Māori communities likely have the most complete knowledge of our land and its native inhabitants. Dr Amanda Black (Tūhoe, Whakatōhea, Te Whānau-a-Apanui) plays a role in recognising this knowledge as co-kaihautū (co-leader) of a Māori-focused strand of the Biological Heritage National Science Challenge. This Challenge aims to protect New Zealand’s unique plants and animals from invading pests and non-native species. 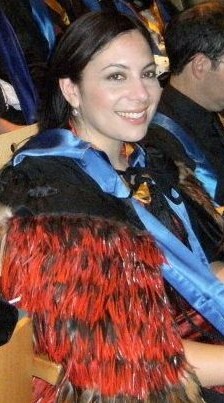 From Whakatane, Amanda headed south to study geology and then environmental science at the University of Otago, followed by a PhD in soil chemistry at Lincoln University – where she’s now Lecturer at the Bio-Protection Research Centre. What was your journey in incorporating Māoritanga in your scientific research? “The journey to get to the point where you can start to consider Māoritanga in your discipline is really a process of thought maturity. You go to university, you train 7-10 years in your chosen scientific discipline and you start to gain confidence. Some time later, a few more papers, and you start to critically think about some the underlying philosophies that perhaps constrain some of the thought processes. Do you happen to use any tikanga into your work? Why do you think it’s important we consider Mātauranga Māori as well as science in tackling New Zealand’s problems? “Mātauranga Māori is about knowledge and how that knowledge is applied. Like other indigenous knowledge, it is acquired through centuries, and in some cases millennia, of familiarity with that land and the flora and fauna that inhabit it. There is much to learn from indigenous people, and problems are nearly always easier to solve when many different angles are considered. To not consider Mātauranga Māori in certain fields of research would be almost irresponsible, especially if the goal was a shared one. What areas are we starting with for the Biological Heritage National Science Challenge? What will you be looking at and trying to solve/contain? “There are three standalone Māori-focused projects and the remainder of the flagship projects have Mātauranga Māori embedded in them as is appropriate. In the project I am specifically involved with, ‘Māori solutions to risks and threats to taonga species’, we will discuss three broad areas – conservation, primary production and freshwater. “We can’t cover everything and so we must pick certain species or ecosystems where we can make a difference in 5 years – the length of the project. The case of kauri dieback is one that is very public and political, yet there are also other species such as pōhutukawa and mānuka that are at risk of biological incursions such as myrtle rust. The effect of this incursion would devastate populations of pōhutukawa, including the rare Bartlett’s rātā with only a handful of individuals left, but this fungal disease would also have economic impacts on the mānuka honey industry. “The most recent example of the potentially devastating effect of another unwanted species was the Tau fly as picked up in a routine monitoring exercise in January. If the Tau fly was to establish itself in Auckland and the upper North Island this would potentially threaten kamokamo – a much-loved squash and very much a taonga species. “In the case of freshwater biosecurity issues, this is a huge and underfunded area of research. Many hapū (tribes) and Iwi (nations) are concerned for their tuna (eel) as it is threatened by a barrage of issues. I suspect tuna will be on the agenda. What science do we already know, and what information is missing? What Mātauranga Māori will be integrated into tackling these problems? Is there any sensitivity around this traditional knowledge? “Many hapū and Iwi in Northland are using their knowledge to carry out environmental assessments of their ngahere (forests). They have developed cultural health indicators and in some cases have solutions to prevent or manage diseased trees and are actively using these methods to manage their ngahere. “There is much sensitivity around Traditional Knowledge/Mātauranga Māori and it is specific to a hapū or Iwi. The unresolved matter of the Waitangi Tribunal Claim known as Wai 262 Flora and Fauna is fundamental to many of the issues around knowledge and taonga species. What has been done so far and what needs to be done next as part of a joint effort? “The Biological Heritage National Science Challenge is taking this very seriously and has the kahui Māori (committee) advising on cultural issues and providing an overarching strategy. For me it is the most pro-active group I have been involved with and it is attempting a shift in the way we as scientists traditionally approached research development. “The Challenge has been evolving and learning in this space and so it has developed an open mind to allowing Māori to develop their research ideas in a ‘mainstream’ research funding mechanism. It’s constantly evolving to the developments and needs of the research community, and any pushback usually comes from external sources rather than the Challenge itself. How might new information from scientific research feed back into indigenous communities? “Partnership that has formed from transparent communication and relationship establishment – that’s how information can feed back into communities. Tēnā rawa atu koe, Amanda, for sharing your story.